Shop at the store that boasts elegance and a boldness that is "truly French, truly DELSEY". Mabuhay Miles Our Partners Promotions Shop at the store that boasts elegance and a boldness that is "truly French, truly DELSEY". 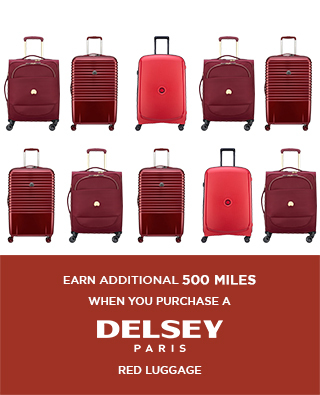 CNY Offering:	PLUS 500 Bonus Miles upon purchase of any RED colored Delsey luggage. 1. Promo runs from February 01 to 28, 2019. 2. Offer is valid in all Delsey, Flight 001 and Travel Club stores. Per DTI-FTEB Permit No. 1723, Series of 2019.